Mesa boys volleyball coach Ray Lewis commends his team after its sweep of region-rival Westwood on Wednesday. (AzPreps365 photo). 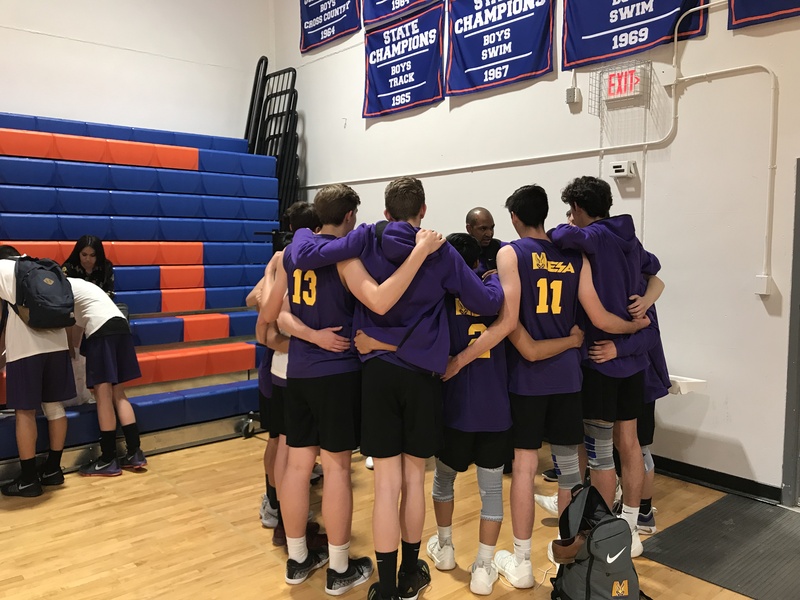 Mesa boys volleyball coach Ray Lewis thought his young team had talent, but to be sure he liked the fact a tough schedule early would test his outlook. Shortly after spring break Mesa embarked on a three-match stretch facing No. 1 Highland, No. 4 Mountain View and No. 3 Chandler. The Jackrabbits dropped all three matches. That trio, however, just happen to be the three of the four teams in 6A in the power-rankings as the halfway mark of the regular season dawns. No shame in losing those. Mesa looked seasoned and confident in its latest match Wednesday as Jackrabbits took region foe Westwood apart in a 25-11, 25-14, 25-13 romp at Westwood High. "I knew those matches were ones we needed to get a feel of where we are," Lewis said. "After playing those our guys understood they can compete with anybody. We played very well tonight. Showed a little more of our offense and were more balanced"
Westwood (8-3 overall, 5-3 power-ranking matches) entered play No. 10 in the power rankings. Mesa was No. 11, and now at 10-8 overall and 4-4 in prm, is primed to climb closer into the top-10. Mesa's strength of schedule is the second best in the conference. Mountain View leads the East Valley Region race at 3-0 with Mesa alone in second at 2-1. 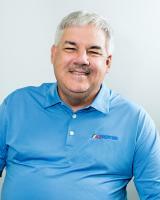 "Mountain View is the team to beat in our region," Lewis said. "We lost 3-1 to them and one of the sets we lost was by two. We're seeing what we are capable of doing." Mesa never trailed the entire match and distanced itself from Westwood quickly in each set. Mesa was led by junior right side Brigham Spilsbury with 14 kills, Junior outside hitter Tucker Cunningham with 8 kills and junior Jothan Castillo with five kills. Castillo added six aces and junior setter Ty Gardner was busy spreading the attack with 29 assists. Only one of Mesa's starters -- libero Tyson Dickson - is a senior and is the only senior on the team. 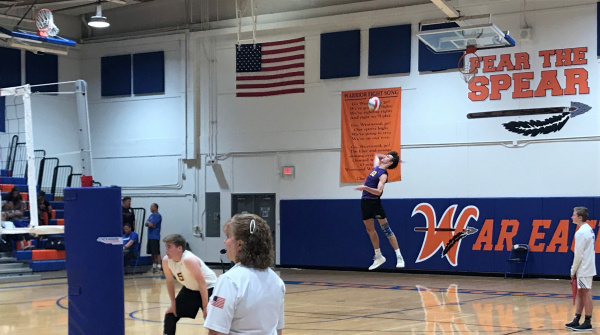 Westwood struggled in several phases much of the night and coach Brian Hanna exhausted both timeouts in each set trying to get the Warriors in sync. Westwood did a better job blocking late in the second set on, but it was not to be the Warriors' night. Jacob Parke led Westwood's attack unofficially with six kills. Both teams continue region play Thursday with Westwood visiting Mountain View while Mesa goes home to face Dobson.